FACT CHECK: Did Donald Trump's 2018 Budget Proposal Include Cuts in Support for Disabled Veterans? Did Donald Trump’s 2018 Budget Proposal Cut Support for Disabled Veterans? The president's plan did call for changes that would have had a significant financial effect on some disabled veterans, but the policy has been abandoned. Under one of many possible scenarios, disabled veterans could have seen their annual disability benefits fall from around $35,000 to around $13,000 under Donald Trump's budget proposal to cut "individual unemployability" for disabled veterans who were old enough to receive Social Security payments. The amounts presented would only have applied to veterans with 60 percent disability ratings who lived alone; veterans with higher disability ratings and more dependents would have had a lower percentage cut. The proposal has also since been abandoned. As a presidential candidate, one of Donald Trump’s main campaign promises was to improve the treatment of United States military veterans and initiate major reforms to the Department of Veterans Affairs (VA). As is usually the case with memes and macros, this was not an entirely accurate summation of the political situation. President Trump did propose cutting a particular benefit for some disabled veterans in his March 2017 federal budget proposal; however, his administration backed away from the plan after an outcry from veterans’ groups and abandoned the provisions that would have produced those cuts. The biggest cut Trump proposed [in his 2018 budget] was ending a benefit for disabled veterans once they reach the minimum age for Social Security benefits. These veterans would see their income plunge from almost $35,000 annually to less than $13,000 if the Trump plan becomes law. Individual Unemployability … allows VA to pay certain Veterans disability compensation at the 100% rate, even though VA has not rated their service-connected disabilities at the total level. In order to qualify for IU, a veteran must be assessed as being at least 60 percent disabled due to a service-connected disability or disabilities. As Johnston correctly wrote, Donald Trump’s initial 2018 budget proposal ended individual unemployability for disabled veterans once they became eligible to receive Social Security benefits. However, Johnston did not mention that, under President Trump’s proposal, disabled veterans who received Social Security benefits would continue to be paid disability benefits by the VA, albeit at their originally-assessed disability rate (rather than at a 100 percent rate), and anyone not eligible for Social Security would continue to receive IU. Veterans eligible for Social Security retirement benefits would have their IU terminated upon reaching the minimum retirement age for Social Security purposes, or upon enactment of the proposal if the Veteran is already in receipt of Social Security retirement benefits. These Veterans would continue to receive VA disability benefits based on their original disability rating, at the scheduler evaluation level. IU benefits would not be terminated for Veterans who are ineligible for Social Security retirement benefits, thus allowing them to continue to receive IU past minimum retirement age. The Trump administration estimated that the proposed cuts would save $3.2 billion in 2018 and $40.8 billion over 10 years and had proposed using those savings to help fund a plan to expand and make permanent the Obama administration’s Veterans Choice Program, which seeks to improve the availability of care for veterans in their own communities. The argument for this cut is that these senior citizens would be eligible for Social Security retirement benefits at age 65. That argument is flawed because these veterans have largely been disabled, out of the work force and not paying into Social Security for many years before reaching 65. Many have been severely disabled as a result of their military service and unable to work since the day of their discharge. 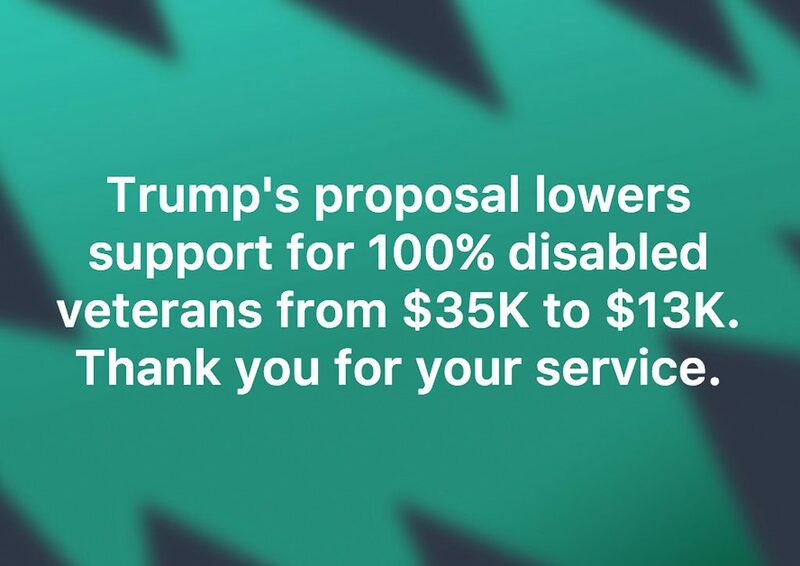 AMVETS estimated that Trump’s proposal would affect 225,000 military veterans aged over 65 and would decrease by a full $1,200 a month the disability benefit paid to an unmarried veteran with a 90 percent disabled rating. The payments that veterans receive under IU depends upon their disability rating and family circumstances, as outlined by the VA. For example, a veteran with a 60 percent disability rating who lives alone would theoretically receive $1,083.52 in disability benefits each month. However, under individual unemployability, veterans are treated as if they had a disability rating of 100 percent, meaning they would receive $2,973.86 each month. For veterans eligible to receive Social Security, Trump’s plan would have pruned their monthly disability benefit back to the 60 percent rate, a highly significant cut of $1,890.34, or 63.6 percent. Over the course of a year, that would have brought their disability benefits down from $35,686.32 to $13,002.24, roughly the amounts mentioned by David Cay Johnston in his book and in the Facebook meme. Such veterans would be in receipt of Social Security benefits as well, but it’s easy to see the significant financial effects the plan would have had on an aging veteran who was unable to work and who lived alone. By comparison, a retirement-aged veteran with a 90 percent disability rating and a dependent spouse, a child, and two parents would have seen annual disability benefits cut from $42,326.64 to $27,356.16, a decrease of 35.4 percent. As I began to listen to veterans and their concerns and VSOs [Veterans Service Organizations] in particular, it became clear that this would be hurting some veterans, and that this would be a take-away from veterans that can’t afford to have those benefits taken away. And I’m really concerned about that…I am not going to support policies that hurt veterans. The following October, Shulkin wrote to veterans service organizations to confirm that the VA no longer supported ending IU for disabled veterans who are eligible to receive Social Security. Johnston’s analysis, and the Facebook meme posted by Stacey Sharp, are both true in a narrow sense. The amounts they mentioned were accurate but were based on only one of many possible scenarios for disabled veterans. 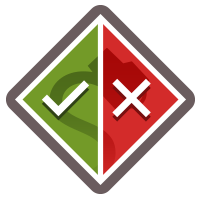 The latter, published in January 2018, left out that the proposal had been abandoned by then. Johnston, David Cay. It’s Even Worse Than You Think: What the Trump Administration Is Doing to America. Simon & Schuster, 2018. ISBN 1-501-17416-9 (p. 225). American Veterans. 24 May 2017. Stars and Stripes. 13 October 2017.